You can eat coconut plain or use it in recipes. Fresh coconuts yield healthy coconut water, edible coconut meat and, if you properly dry and preserve it, a shell that you can use as a small bowl. The finished bowl makes a practical vessel for holding dry items, or you can simply preserve it as a decoration. When you purchase a coconut from a grocery store, the hard part -- the tough husk -- has already been removed for you, but you must still crack open the shell neatly to make it worth saving. Locate the three soft indentations, arranged much like the holes in a bowling ball, at one end of the coconut. Hold a screwdriver against one of these soft spots and tap the handle with a hammer to punch a hole. Repeat with one or both of the remaining holes. Hold the coconut over a bowl or cup to drain the coconut water out through the holes. Drink this water plain, add it to a smoothie or use it to flavor your other dishes. Hold the coconut firmly in your non-dominant hand with the ends facing out to the sides. Locate the thin line along the equator of the coconut, which is the natural line along which you will split the coconut in half. Smack the back side of a large knife, such as a carving knife or meat cleaver, against the line on the coconut. Hit the coconut with about as much force as you would use when punching your fist to your palm. Rotate the coconut slightly and crack the knife against the line a second time. Repeat this until you hear a cracking sound as the coconut splits in half. Hit the coconut with less force until it completely separates into two pieces. This might take just a few smacks or two or three full revolutions because some coconuts simply split open easier than others. Position a spoon between the coconut meat and shell with the back of the spoon facing the shell. Pry the meat away from the shell, removing the meat in chunks as it breaks loose. If the coconut doesn't separate easily, cut it into sections with a knife all the way to the shell and chip it away in pieces. Some coconuts are particularly difficult to clean, but the oven can help. Place the halves on a baking sheet and bake at 350 degrees Fahrenheit for an hour or two. The coconut shrinks away from the shell while cooking. When cooled, you can pull out the meat in one piece. Place the coconut shells in a dry, well-ventilated area with the shell-side down for a week or two to allow the shell to dry. You can simply place the shell on a shelf as a decoration during this time period. If you were unable to remove some pieces of the coconut meat, they will shrink while drying, making them much easier to remove. 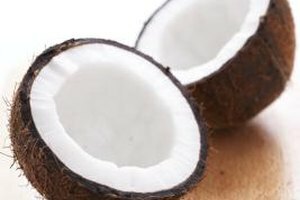 You can actually use only one-half of the coconut shell to contain liquid because you poked holes in the eye end of the coconut. 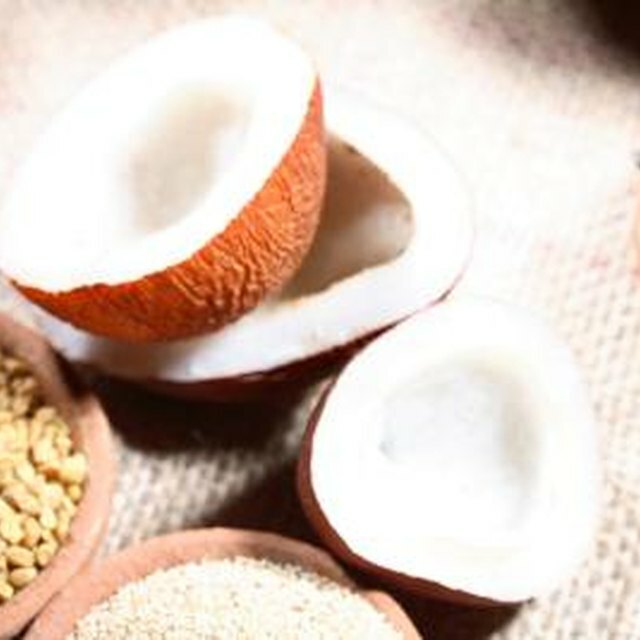 While you don't want to turn a coconut shell into your regular cereal bowl, the shells make an interesting serving dish for dry foods such as peanuts and candy. The Naughty Vegan: How to Open a Mature (Brown) Coconut!